...began his career at the Barter Theater of Virginia. Since then he has enjoyed international success at the Festival Blues Sur Scene and Festival L’Imaginaire and in Paris as well as productions in Berlin, ﻿Moscow, ﻿London, Athens, Taipei, Budapest, the XIX Winter Olympics, and dozens of locations around the world. Design credits include work with﻿ the Jose Limon Dance Company, and Compania Nacional de Danze (Palacio de Bellas Artes- Mexico City) having designed , "Esquinia Bajan", and "El Pajaro de Fuego", as well as the ballets of John Cranko, "Eugene Onegin" and "Romeo and Juliet". Continuing work in Europe includes Introdans in the Netherlands as well as "Rite of Spring" for Joost Vrouenraets and the new musical, "Blind Lemon Blues" having performed in Switzerland, France, Belgium, and the Netherlands. 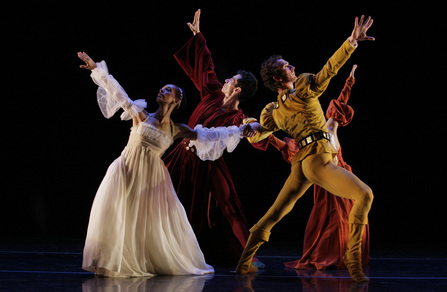 A frequent designer for the Jose Limon Dance Company, he began work with the company in 1988 and has continued to design many of the Masterworks of Limon including, "There Is a Time", "The Moor's Pavane", "Traitor", "Missa Brevis", and "The Winged" among others. When the company was invited to perform at The White House he was there to light both "The Moor's Pavane" and "A Choreographic Offering." Since then he has designed works for Alwin Nikolois, Martha Grahamn, Donald McKayle, Garth Fagan, Phyllis Lamhut, Carlos Orta, and Daniel Nagrin among others. His work with Theatre for a New Audience earned a Lucille Lortel Award for the production of "Henry V". Recent projects Off-Broadway include Neil Young's "Greendale" and "Blind Lemon Blues". In New York City his work has been seen at the Lincoln Center for the Performing Arts, The Juilliard School, Theater for a New Audience, Riverside Church, Ohio Theater, York Theater Company, Joyce Theater, Ice Factory Festival, Soho Think Tank, Central Park Summer Stage, Guggenheim Museum, Masters of American Dance, and St. Mark's Theater. Elsewhere his designs have been seen at The Shakespeare Theatre Company (DC), Kennedy Center for the Performing Arts, Jacob's Pillow Dance Festival, Undermain Theater, American Dance Festival, Cumberland County Playhouse, Dallas Theater Center, Kitchen Dog Theater, Music Center-Performing Arts Center of Los Angeles, Shakespeare Festival of New Jersey, TheatreVirginia, Heritage Repertory Theater, Utah Festival Opera, and the Spoleto Festival.